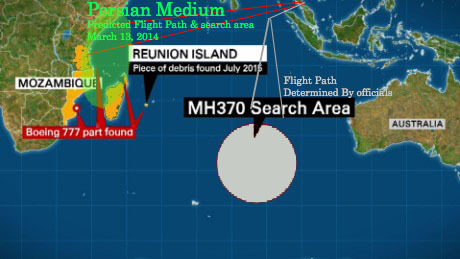 LOS ANGELES - June 27, 2016 - PRLog -- Persian Medium, a world-renowned psychic advisor who had predicted the location and flight path for the Malaysian Airliner MH370 accurately over two years ago, has been confirmed by independent reports regarding the debris found on the southeastern African continent and nearby Islands. Recent reports where experts examined the plane parts found in the Indian Ocean near Madagascar and Tanzania reported that the plane parts are most certainly from the doomed MH370, https://blogs.crikey.com.au/planetalking/2016/06/27/independent-analysis-says-tanzania-object-mh370/. In recent days there have been multiple reports of debris found on Islands near southeastern Africa and shores of Tanzania and Mozambique. Independent reports have all confirmed that the plane parts are from the doomed flight and officials are pressed for more answers and continuation of search efforts, which are scheduled to end in July of 2016 regardless of any answers. Fiona, Persian Medium, on March 13th of 2014, just a few days after the disappearance of the airliner, predicted the approximate location of the doomed flight. She also indicated a flight path in the direction of Somalia. No other psychic has gotten the details so accurately and has been so close to finding actual debris. Her initial prediction was posted on MSNBC's related story line http://www.msnbc.com/all/all-agenda-hours-the-air. As the map outlines, she predicted a flight path in the direction of Africa. She indicated a flight path as shown, which is much different than the flight path outlined by officials. She also noted the search area as Somalia and an area south of a place surrounded by water. In fact, official accounts of debris found have also been confirmed NOT to be from MH370. A recent finding of plane debris found in Australia's Kangaroo Island was debunked officially http://www.cnn.com/2016/06/22/asia/mh370-debris-kangaroo-island-atsb/index.html. "At the time of the incident, when everyone was confused and panicked, I had predicted the plane being close to Africa. At that time there was hope for finding survivors and because of the sensitive nature of the human tragedy and out of concern and respect for families of the passengers I tried to sound as positive as possible. The world of Spirits works in mysterious ways and does not always follow a logical explanation or official GPS," Said Fiona, the Persian Medium. The predictions have been really accurate. Her clients, who can find her on Keen, a site where she offers amazing readings, continually and consistently mention her accuracy and consult with her on a regular basis. Persian Medium weekly radio shows can be heard on A1R psychic radio at http://www.ask1radio.com/fiona/ where she hosts shows weekly. She also hosts sponsored shows by Keen on A1R psychic radio. The programs are often very exciting and emotional where surprised callers are pleased with their accurate readings. Her bio and account of stories are available on her website www.persianmedium.com. Persian Medium provides psychic advice. Her inspiring story can be read on http://persianmedium.com/about.html. She has honed in on her gifts by going through rigorous training by some of the most sought after psychic masters in the world. She has been able to sense and detect lost people and items, and provide accurate advice on business and professional matters. Her thousands of followers trust her instincts and visions and have provided an unimaginable number of feedbacks and information about her readings. Fiona has won several psychic challenge awards and has hosted radio and TV programs where she has been challenged by most difficult questions. Persian Medium is currently providing advice through Keen.com and/or private consultations by appointment through her website www.persianmedium.com.